More than 700 firefighters are battling a major wildfire in southern Portugal’s Algarve region, as parts of Europe continue to swelter. Temperatures reached 46C (115F) in places, close to Portugal’s national record of 47.4C (117.3F). Soaring temperatures continued in Spain, where three deaths by heatstroke were reported. 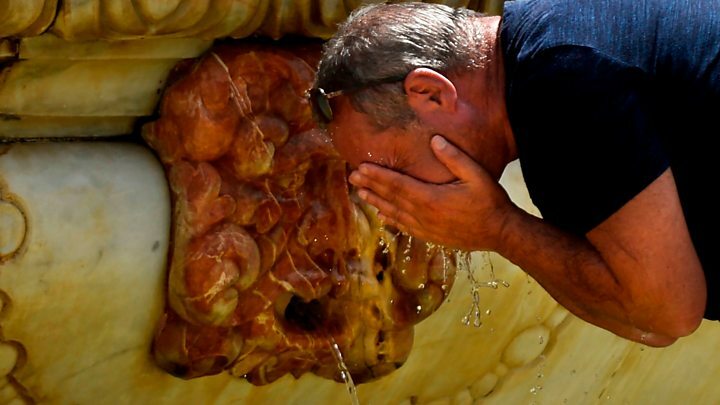 A continent-wide heatwave in recent weeks has seen drought and wildfires from Greece to Sweden. Temperatures above 40C in Spain and Portugal are expected to continue at least until Sunday. Portugal’s Civil Protection Agency has been sending mobile text alerts warning of extreme fire risk in some areas, as they seek to avert casualties. Dozens of people were killed in two major forest fires last year. Friday saw local all-time record temperatures at almost half the country’s weather stations. 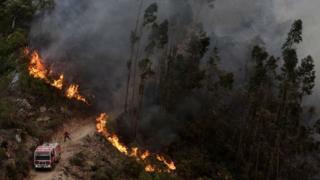 A major fire broke out on Friday in Monchique, in Algarve, consuming more than 1,000 hectares of forest and forcing evacuations from one village. On Saturday the fire was boosted by 46C temperatures with “a real feel of 50C”, rescue operations head Victor Vaz Pinto told local media. The fire has been spreading through eucalyptus forest and dense undergrowth, the Civil Protection Agency says. Ten water-dropping planes have been assisting the firefighters. Meanwhile in Spain, media reports said two people died of heatstroke in the southeastern Murcia region, while a third – believed to be homeless – died in Barcelona. Temperatures reached 44C in the southern city of Cordoba. Wildfires have been raging near Nerva, southern Spain, and near the capital Madrid. More fires have been reported in the Estremadura region close to the Portuguese border and in Catalonia near the French border. The sweltering Iberian temperatures follow weeks of sustained heat across Europe, which saw Sweden’s highest peak – a glacier – melting at a rate of several centimetres a day. In Greece high winds fanned dangerous wildfires which killed more than 90 people.